The Estate Papers of Smith of Jordanhill dated 1883 contain an entry for 28 cottages which included "Helensburgh Place, 7 cottages, (one fitted up as a small shop) erected in 1877 at a total cost of £1240. Yield on investment 3%". All these cottages were owned by the Smiths of Jordanhill who paid for their construction. It is known that Mr Archibald Smith (who died at the end of 1872, see chapter on his life) used part of a lump sum of £2000 awarded to him from the British Government as a reward for his work on magnetism and ship's compasses (which proved invaluable to the Navy) to build the row of houses known as "Compass Cottages". These are situated on the north side of Anniesland Road, running east from Munro Place. I recall seeing a stone plaque bearing the title "Compass Cottages" but it was removed from the front wall during refurbishment some years ago. In the early days all the occupying families were tenants, not necessarily employed by the Estate. I have a copy of the 1872 plan of Compass Cottages which gives details of two adjacent three apartment houses which fitted together like a jigsaw. In one house, the small entrance porch led into a 16ft by 16ft "Kitchen" at the front of the house which was fitted with two built-in recessed beds. Leading directly off the kitchen there was a small long narrow scullery at the back with a door to the rear garden. Also at the back of the kitchen was a small hallway which gave access to two "Rooms", 15ft by 12ft and 12ft by 12ft, the latter having one bed recess additional to its square floor area. There was a fireplace in each of the three rooms and a coal bunker in the scullery. In the house next door, the entrance porch led into two rooms at the front. The "Parlour" was 13ft by 12ft with an additional bed recess and the "Kitchen" at 16ft by 16ft had two additional built in bed recesses. At the back of the kitchen there was a door to the narrow scullery at the back of the house and a door to a "Room" at 15ft by 12ft. Again there was a fireplace in each of the rooms. On closer inspection of the all the cottages in the immediate vicinity at the present day, it will be noted that the 28 of them referred to above as having been built by the Smiths are all similar in appearance with a line of castellated brickwork just below the eaves line. However there are also 6 cottages at the south end of Craigend Street built to a different design which are not listed as belonging to the Smith Estate. In addition there is a row of 11 cottages on the west side of Munro Place at the mid point of which there is a plaque stating "Jordanhill Building and Land Society Limited. 1877" In the archives there is a letter written in 1877 from Mr James Parker Smith (son of Archibald Smith) to Mr Munro the minister of the local church (see Chapter on Jordanhill Church) regarding the welfare of his tenants and suggesting that they form themselves into an association with a view to building houses for themselves. It is as a direct result of this correspondence that the above Society was formed. Initially a site for their housing had been suggested further west (where the Telecom buildings now stand at the corner of Lincoln Avenue) but this was rejected because there was no water, drainage or gas available. The site on Munro Place (named after the minister) was subsequently provided by Mr Smith. The present house at the west end of the row of Carbeth Place Cottages has been built separately (on a different front alignment) and was originally a shop (see below). The 1859 First Edition of the Ordnance Survey shows two buildings (labelled "Brick works") on the site of what is now the Helensburgh Place Cottages. At the west end of the brickworks there was a track heading due south across open fields and leading to a building called Woodend Cottage which was later demolished to provide the site for the present Jordanhill Church. Note that the kerb stones forming the entrance to that road still exist on the pavement at the west end of the Cottages. Helensburgh Drive did not exist even as a track but an "Old Pit" shaft was shown in the field south of the Brickworks at a point which is now in the centre of Helensburgh Drive. There were no cottages on the north side of what is now Anniesland Road. Anniesland Road is not named as such, since at that time it was known as the Turnpike between Anniesland and Yoker. The 1895 Second Edition of the Ordnance Survey shows that the Brickworks has gone and is replaced by the terrace of 7 houses which is Helensburgh Place, but it is not titled as such. The track at the west end of the row still connects with what is now Woodend Drive. All the cottages on the other side of Anniesland Road are shown, as they are to-day. There is still no sign of Helensburgh Drive and what we know today as Jordanhill was still open fields Munro Place was a short cul-de-sac. By 1913 when the Third Edition of the Ordnance Survey was published, parts of the residential area of Jordanhill were being developed (the housing in King Edward Road, Milner Road and parts of Woodend Drive had appeared). The Glasgow Academical Grounds had been laid out and these severed the track which had previously led south from the west end of Helensburgh Place Cottages. The first six terrace houses on the west side of Helensburgh Drive had appeared together with the large villa at the junction with Anniesland Road which was labelled "Manse". On the north gable of the manse there is a date stone for 1908 which ties in nicely with the period between the publication of 1893 and 1913 OS sheets Helensburgh Drive was known at that time as Helensburgh Road and the name Helensburgh came from the Smith's close association with the town of Helensburgh where the family moored their large cruising yacht. Apart from the fact that it was recorded as early as 1883 that the eastern house in Helensburgh Place Cottages had been built as a "house and small shop" there is nothing to indicate a direct connection between the entry for "grocer's shop" and the present shop at 205 Anniesland Road. Valuation rolls (see later) describe the tenant of the house and shop at 205 as a confectioner, whereas No 234 on the other side of the road, at the corner of Craigend Street, was always listed as a grocer's shop (as distinct from "house and grocer's shop"). Furthermore since the census record for the grocer's shop listed a family of seven under that same heading, and since there was never any indication to suggest that anyone lived in the shop at No 234, it is not unreasonable to assume that the entry for the "grocer's shop" relates to No 205. This assumption is further strengthened by the fact that if the grocer's shop at 234 did not have a house attached, there would be no entry for it in the census. Accordingly it is highly likely that the entry in the 1881 census relates to the present shop at No 205 and its entry was as follows. William Dunn, the head, aged 51 an engine keeper; Mary Dunn, wife aged 41: James Dunn aged 17: William Dunn aged 14, iron miner; Jane Dunn aged 12, scholar; Mary Dunn aged 9, scholar and John Dunn aged 3. Note that the head of the house appeared to have an occupation other than keeping the grocer's shop and his wife was shown as having no occupation at all. Nor was the eldest son James shown as having an occupation, although the second eldest son, aged 14, was already an iron miner, presumably in the local pits. The 1891 Census was more helpful, but still a bit confusing. Under the entries for "Anniesland, Helensburgh Place" there were listed nine households (for seven houses?). However there was no mention of a shop, and the first household as listed showed the Hamilton family of 11 people. Although there was no sign of the Dunn family who had lived there 10 years earlier, it is reasonable to make a connection to No 205 which now housed a family of eleven. 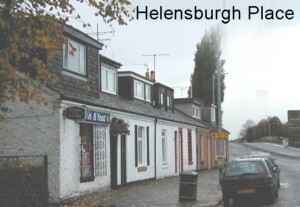 The other households listed under "Helensburgh Place" contained respectively 4 occupants, 8, 8, 8, 8, 2, 2 and 2. These last three entries for individual households could be explained by the assumption that the most western house was at that time subdivided into three "single ends". The 1901 Census will be released in December 2001 and reference to it may clear up the above issue. It may be of interest to note that the 1891 census clearly listed the 7 named "Compass Cottages" which had 3, 8, 5, 7, 7, 5, and 3 occupants. Miss Mary Stirling, who was the tenant and head of the first cottage listed was aged 41 and her occupation was given as "living on private means". 4 Glasgow Post Office Directories. This part of Renfrewshire was not annexed to Glasgow until 1913, so there is no mention of Anniesland Road in the very useful Post Directories of the time. The first entry for Anniesland Road appears in the 1914/15 edition but lists only a few named houses which are those large villas located near Southbrae Drive and Queen Victoria Drive. The Mitchell Library has a large collection of Voter's Rolls but the earliest available for this part of Anniesland is 1913, when the area was first annexed to Glasgow City. Reference to these did not prove rewarding. Women did not get the vote until 1920 so that in itself limits their usefulness. However it is surprising to note that the 1913 Supplementary List for Voters eligible to elect City Councillors (as distinct from the list of those eligible to elect Members of Parliament) included the name of Mary McKay, tenant, confectioner, at 205 Anniesland Road. As already stated the earliest available valuation rolls for Anniesland Road date from 1913. The entry for 205 Anniesland Road describes the premises as "House and shop". The owner is given as the Trustees of Mrs Susan Emma Parker Smith per D D Baird, Banker, Govan. The tenant was shown as Mary McKay, described as a "confectioner" and the annual rental was £8. Other entries for the tenants of Mrs Parker Smith were: No 207, David Lyle, caulker; 209, Mrs Annie Allison (no occupation listed); 211, William Alexander, journeyman bricklayer; 213, John Goodbrand, police constable; 215, David Jeffrey, miner; and 217, Robert Rowan, miner. The other six houses had an annual rental of £7 15 shillings (£7.45), just 5 shillings less than the "house and shop" at 205. Later valuation roll entries for No 205 show many changes. In 1945 the owner had become Archibald Parker Smith with an address of "Brooks's, St James London with Mrs May Ewing, confectioner, as the tenant paying a rental of £15 per annum. The Roll for 1970 was the same as for 1945, but by 1978 Janet Hunter was listed as the proprietor which indicated that the Smith Family had finally sold the property some time between 1970 and 1978. Title Deeds (see later) would confirm precise details. Following the fortunes of the grocer's shop at No 234 in the valuation rolls gave the following information. The ownership by the Smiths was the same as given for No 205 (see above). In 1913 the property was listed as "shop" with the tenant being William Martin, grocer, paying an annual rental of £26. Note that this is more that three times the annual rental for the "house and shop" at No 205, so it may be assumed it was quite a prosperous business. In 1945 it was still recorded as a shop but the tenant had become William McKay and he was still there in 1970. However in 1982 the property was listed as "house" with the proprietor listed as a Mr Denmark. Thus the shop closed and was converted to its present use as a house sometime in the 1970's. Further research could reveal precise details. 7 Dean of Guild Plans. When buildings are proposed or alterations to existing buildings are being considered, owners must submit details to the Dean of Guild for approval and this has been the case since before the turn of the century. Very few, if any, drawings are available for buildings erected at the end of last century and in any case Helensburgh Place (as previously mentioned) was at that time in Renfrewshire. Examination of the Records from 1913 to the mid 70's did not reveal any submissions for extensions or alterations. Further research in Renfrew's archives may produce some details. 8 General Note on "Title Deeds"
Because the properties were owned by the Smith Family (Jordanhill Estate), it is quite possible that the deeds (including any Feu Charter) may not yield anything worthwhile for the early period. Even although the main part of the estate and Jordanhill House was sold in 1913, which by coincidence was the same year that the surrounding area was annexed to Glasgow, successive members of the Smith family continued to own the cottages and to rent them to tenants until the 1970's It would be well worth obtaining the deeds from the holding solicitor for temporary study and copying. For clarification, the Feu Charter is a document which lists conditions, duties and prohibitions drawn up by the original Feu Superior (i.e. the original Land owner who feued off the land as distinct to selling it outright) to cover a whole group of properties. This document will not normally be among the bundle of Title Deeds for a property but may be held by an independent solicitor who still acts for the Feu Superior and deals with a whole group of properties. The Title Deeds for each property may repeat, but more usually just summarise, the conditions etc., contained in the Feu Charter but will add specific information relative to the particular property such as lengths and orientations of the four boundaries, specific annual payments relative to its size and location in the group. The initial deed will record facts relating to the first purchaser. For each subsequent sale there will be a "deed" and if the purchaser had to borrow from a lender there will be a deed for that transaction. For this reason the Title Deeds for an old property can contain many multi-page documents of repetitive legal jargon.